A small right posterior frontal subcortical white matter hyperintensity is present. As an isolated finding, MS must be suspected but other conditions are definitely possible (see slide 3). On scanning other parts of the brain, the more characteristic images of MS are seen: multiple small pericallosal white matter intensities characteristic of MS. 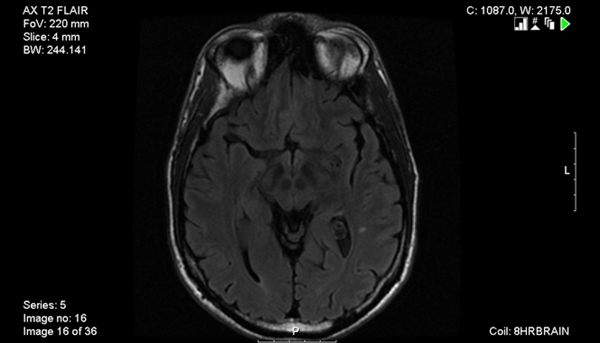 This person has MS.
A subcortical white matter hyperintensity similar to slide 1. However, in this case, there were no additional abnormalities. 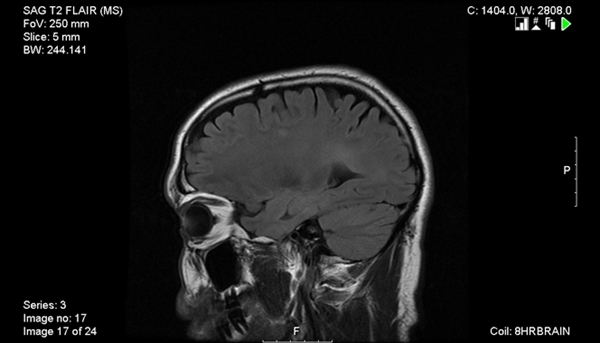 On an imaging basis alone, MS could not be diagnosed but remained part of the differential. This person was ultimately diagnosed with migraine headaches. Multiple pericallosal lesions seen on sagittal section. This pattern is similar to that seen in the patient shown in slides 1 and 2. However, there is no known diagnosis of MS, but the patient has autoimmune /mixed connective tissue disease. This is an example of a patient that has involvement of one of the most characteristic anatomical areas known to be affected by MS. However, not all intensities in these locations are due to MS, though an autoimmune cause is likely. There is a confluent white matter intensity process affecting the parieto-occipital lobe. This represents, as an isolated finding, nonspecific white matter disease which, in the appropriate patient and with no other characteristic abnormalities on brain MRI, would be consistent with MS but not diagnostic. The location, however, is one of the most common anatomic areas involved in the condition called posterior reversible encephalopathy syndrome (PRES). 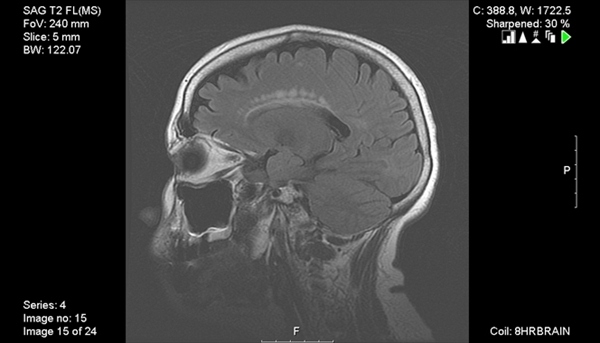 This patient had a seizure and did, in fact, have PRES. Image A (left) shows an MS spinal cord lesion on TI weighted imaging with contrast enhancement. MS lesions here are generally oval-shaped and do not extend to more than 1-2 vertebral bodies. Image B (right) shows a classic neuromyelitis optica-positive spinal cord longitudinal lesion spanning more than 3 vertebral bodies on T2 weighted imaging. FLAIR hyperintensities located in the anterior portion of the temporal lobe (O’Sullivan sign) is characteristic for cerebral autosomal-dominant arteriopathy with subcortical infarcts and leukoencephalopathy (CADASIL), an autosomal dominant disease with Notch 3 mutation resulting in small vessel vasculopathy. CADASIL clinically presents with neuropsychiatric manifestations, strokes, and migraine headaches. Cases have been reported that show MRI enhancing lesions, therefore if suspected, genetic testing should be sent. 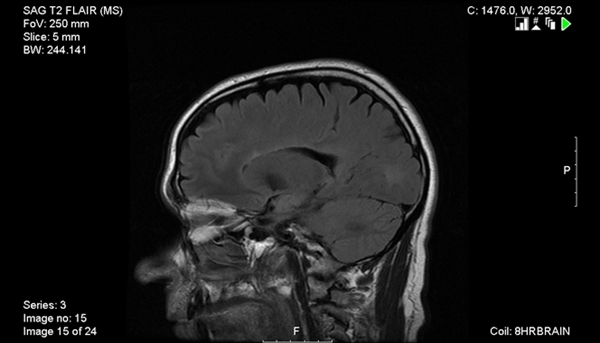 On MRI, hyperintensities within the anterior temporal lobe (O’Sullivan sign) is a clue to the diagnosis. 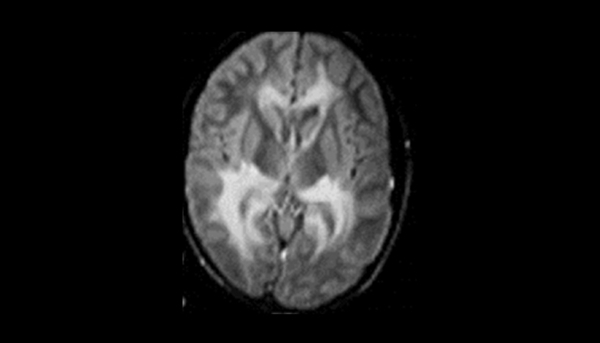 FLAIR MRI of adrenoleukodystrophy (ALD) with confluent white matter changes predominantly in the posterior lobes. Leukodystrophies such as ALD or metachromatic leukodystrophy (MLD) can be confirmed with genetic studies. MRI generally shows frontal predominance in MLD and posterior predominance in ALD. It is best to refer patients to a neurologist specializing in genetic leukodystrophies when this diagnosis is suspected, as there are many genetic diseases that can present with white matter lesions on MRI, including the rapidly expanding family of mitochondrial diseases. The accurate diagnosis of multiple sclerosis (MS) typically presents several challenges: There is no definitive test for the disease, and symptoms vary widely between patients. The initial symptoms in particular — such as numbness, tingling, and blurred vision, for example — may be highly nonspecific. Further complicating the process are the numerous other disorders that can cause the same imaging findings that are characteristic of MS. These encompass a wide range of conditions, including various inflammatory disorders, CNS infections, genetic disorders, nutritional deficiencies, and more. 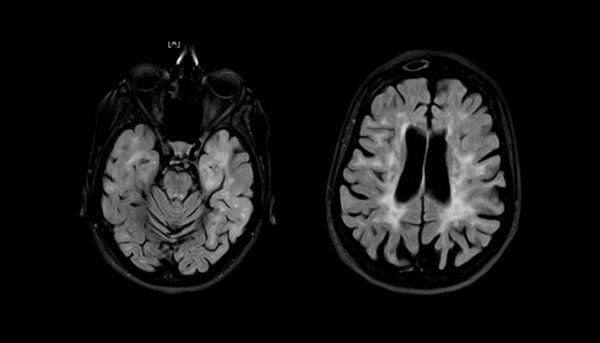 For more on MS mimics, see the corresponding clinical article. Images courtesy of Dale J. Lange, MD, and Darius P. Melisaratos, MD, of Hospital for Special Surgery (HSS) in New York and Nicoline Schiess MD, MPH, of Johns Hopkins University Multiple Sclerosis Center.